For home use we offer paper plate and napkin holders, as well as, knife displays! We are the perfect solution for your hospitality needs! Our products were designed with over 50 years combined experience in the hospitality and food service industry. 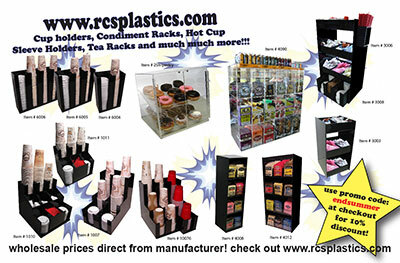 RCS Plastics is the #1 Stop for coffee cup lid dispensers condiment caddies and tea displays. Our quality acrylic plastic convenience store coffee counter retail displays will give your customers a professional atmosphere and increase your sales! RCS Precision Industries uses all high impact-resistant top quality acrylic materials. Our Condiment Displays, Cup and Lid Holders, Milk and Sandwich Coolers, Fork, Spoon and Knife Dispenser, Napkin Caddies and Tea Racks, Paper Plate Holders all use 3/16 inch thick acrylic. We have tested the strength of all of these product and they are more than sufficient to withstand 10+ years of consistent use. Keeping paper, plastic, or foam cups and lids clean and organized at your concession stand, store or market can be tricky especially if you have small countertop areas, limited space and cramped corners. But, with our great selection of coffee cup and lid dispensers, it's never been easier! We can help make your setup practical and efficient. With a 50 year dedication and multiple generations in manufacturing and helping customers in the Food service industries making their dreams and ideas come true. Our staffs expertise in 3D design and extremely quick turnaround helps make RCS the easiest and the best company to work with. We produce extremely high quality coffee cup dispensers, Condiment dispensers, tea racks, cigar and liquor displays, paper plate organizers throughout the United States displaying all of your items in a organized fashion. All of RCS's products are manufactured in The USA to the highest standards in design, materials and construction. We are committed to achieving complete customer satisfaction through product excellence, personal attention and prompt service. The professional assistance of an RCS representative, combined with the information provided on this web site, is a reliable source for meeting your present and future store needs and requirements. At RCS our knowledge in this industry will help Guide you through our large selection of cup dispensers, POP displays, collectable displays cases and dispensing products for lids, straws, condiments, napkins, tea displays, milk and drop-in refrigeration inserts. 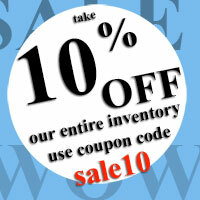 We have a 100% guarantee of any manufacturer defects. Please look at our Policy Page for more policies and shipping info. All of our product are made in our state of the art facility. Quality control is very important to us. All joints are glued and inspected by hand. We use top quality adhesives to bond our displays. Chemical Resistance: Acrylic sheet resists many chemicals, including ammonia, dilute acids, and aliphatic hydrocarbons. A chemical resistance chart is available upon request. Safety: Shatter-resistant and earthquake safe. Light Weight: Even with its strength and durability, it is only half the weight of glass. We always have promotions throughout the year so please call or ask your sales rep. for current details! RCS Plastics Now Offers Services For The Sign and Advertising Industries. Check out our Machining page for details.